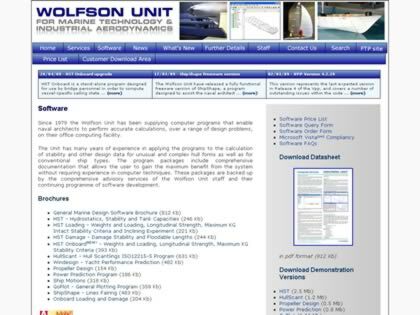 Top : Software : HullScant - Wolfson Unit M.T.I.A. HullScant - Wolfson Unit M.T.I.A. HullScant calculates and reviews the structural scantlings for motor and sailing vessels under 24m. The software package incorporates Final Draft ISO Standard 12215, Part 5. This part deals with pressures and scantling equations for GRP, metal and wood monohull boats. The HullScant software calculates the actual scantling structural properties of a vessel and can compare this with the requirements set out in the ISO standard. The complete materials library from the ISO12215-5 standard is incorporated or the user can enter custom material properties from own test data or other sources. Web Site Snapshot: If available, above is a snapshot of the HullScant - Wolfson Unit M.T.I.A. web site at http://www.wumtia.soton.ac.uk/software.html as it appeared when this site was added to the directory or last verified. Please Note that Boat Design Net has no involvement with the above web site; all content and images depicted in the above thumbnail are the property and copyright of HullScant - Wolfson Unit M.T.I.A. unless otherwise noted on that site. Description: HullScant calculates and reviews the structural scantlings for motor and sailing vessels under 24m. The software package incorporates Final Draft ISO Standard 12215, Part 5. This part deals with pressures and scantling equations for GRP, metal and wood monohull boats. The HullScant software calculates the actual scantling structural properties of a vessel and can compare this with the requirements set out in the ISO standard. The complete materials library from the ISO12215-5 standard is incorporated or the user can enter custom material properties from own test data or other sources. Visit HullScant - Wolfson Unit M.T.I.A.